Faculty, staff, and students from the department attended the combined Association for Communication Excellence and Agricultural Media Summit (ACE/AMS) conference in Scottsdale, Arizona, August 4-8. Several department members presented sessions: Linda Gilmore, with Dr. Quisto Settle from Oklahoma State University, presented “Turn ‘Me’ Time into Productive Time.” Cassie Wandersee ’12, ’16 presented “Advanced Facebook Analytics,” “Building a Program Assessment Tool in Qualtrics,” and “Proving Your Worth Through Effective Social Media Metric Reporting.” Jason Hackett presented “Podcasting 101: A Direct Route to Your Audiences Through Audio.” Audrey King, Lauri Baker, and Anissa Zagonel, along with Kris Boone, Ohio State University, presented “What is Today’s Story? Exploring the Land-grant Mission Through Story Circles.” Jason Ellis ‘98 and Donna Sheffield also attended the conference. 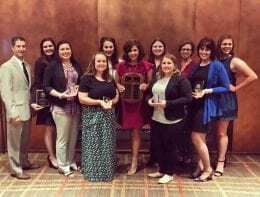 Members of the department won a Silver Award in the ACE Critique and Awards Contest for the 2018 College of Agriculture and K-State Research and Extension Annual Report: Driving Force for Change marketing communications campaign. Those who worked on the project and are included in the award: ACE members Gloria Holcombe, Jason Hackett, Brad Beckman, Mark Stadtlander, and Amy Hartman; and non-ACE members Megan Macy, Dan Donnert, Mary Lou Peter ‘79, Jeff Wichman, Eric Atkinson, Phylicia Mau, Pat Melgares, and Randall Kowalik. Donna Sheffield and Lauri Baker attended the ACE Board of Directors meeting. Donna is the Development Director and served on the conference committee as co-chair of the sponsorship committee. Lauri is the Research Director. Gloria Holcombe received her 20-year certificate for ACE membership. In addition to the club award, Jill Seiler was one of four national Past President’s Scholarship recipients and was recognized at AMS. The scholarship is funded by the AAEA Professional Improvement Foundation and in part by CoBank. Sarah Moyer was a finalist for the Forrest Bassford award through the Livestock Publications Council. 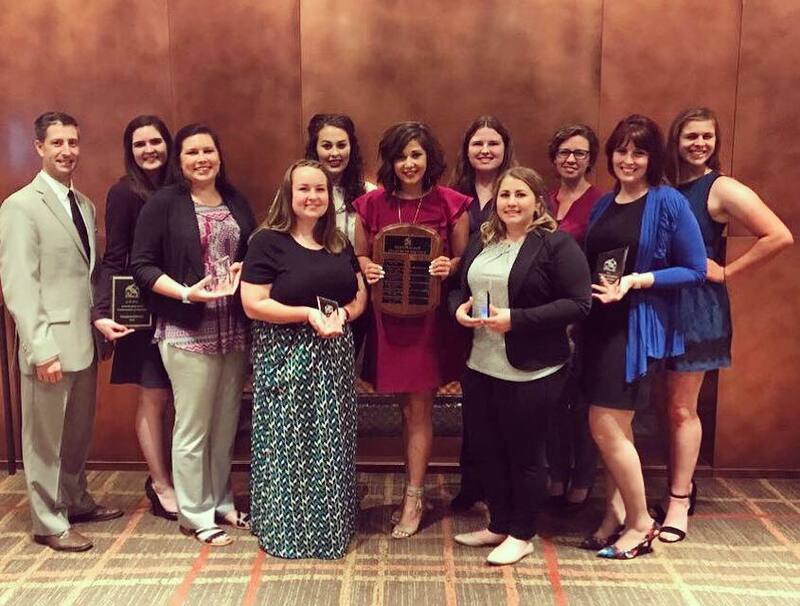 Students who attended AMS included: Undergrads: Janae McKinney, Mary Marsh, Leah Giess, Mikey Hughes, Sarah Moyer, and Tarra Rotstein; Graduate students: Rachel Waggie; and Spring 2018 recent graduates: Jill Seiler and Chelsie Calliham. Audrey King ‘09 and Katie Burke ’10, ‘15 represented them as advisers.